We are excited to announce the open-source release of the Azure Media Services (AMS) Live Monitoring Dashboard on GitHub. 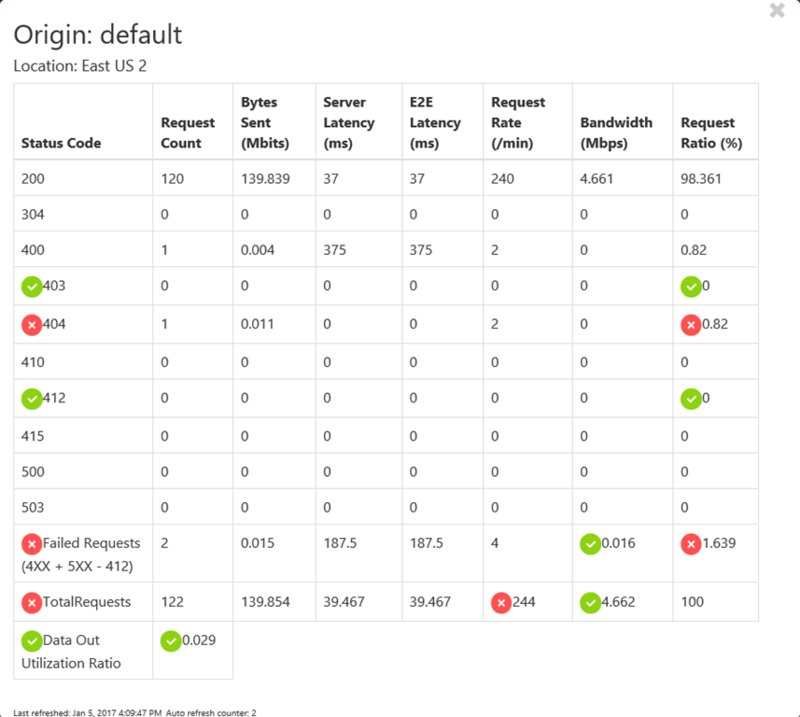 The Live Monitoring Dashboard is a .NET C# web app that enables Azure Media Services (AMS) customers to view the health of their channel and origin deployments. The dashboard captures the state of ingest, archive, encode, and origin telemetry entities, enabling customers to quantify the health of their services with low latency. 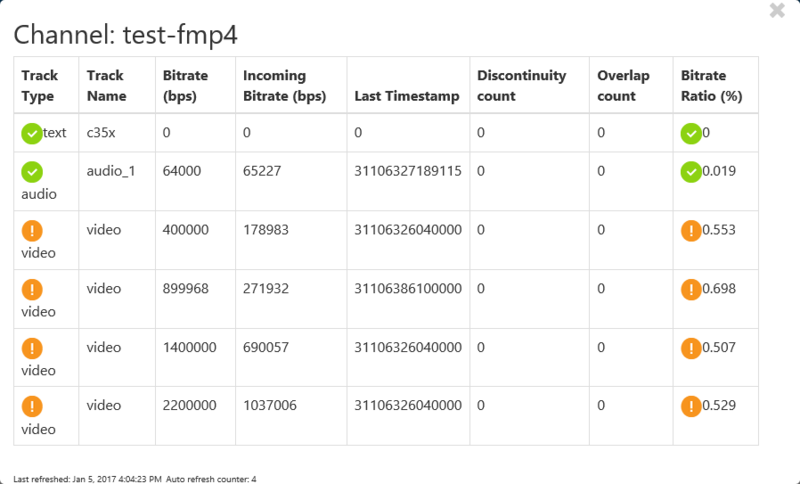 The dashboard supplies data on the incoming data rate for video stream ingestion, dropped data in storage archive, encoding data rate, and origin HTTP error statuses and latencies. Special thanks to Prakash Duggaraju for his help and contributions to this project. 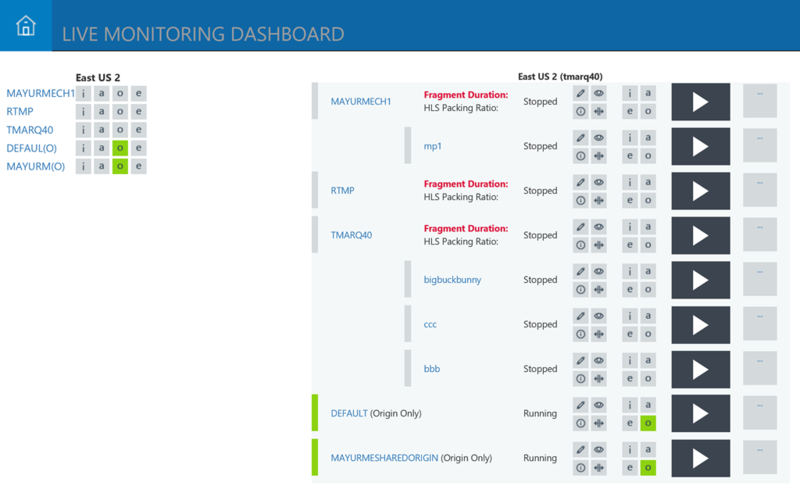 The image below illustrates the account-level view of the Live Monitoring Dashboard. The upper left pane highlights each deployment’s health status with a different status code color. Ingest, archive, origin, and encode telemetry entities are denoted by i, a, o, and e abbreviations respectively. Each color of theindicator summarizes whether an entity is currently impacted. Green denotes healthy, orange indicates mildly impacted, red indicates unhealthy, and gray indicates inactive. You can modify the thresholds for which these flags are raised from the storage account JSON configuration file. From the right pane, you can drill down into the detailed views for each deployment by clicking on the active status squares. This dashboard is backed by a SQL database that reads telemetry data from your Azure storage account. Our telemetry release announcement blog post details the types of telemetry data supported today. Every 30 seconds all views within the dashboard are automatically refreshed with the latest telemetric data. Optimally, a channel should have no discontinuities, no overlaps, and a bitrate ratio of one. Flags are set to raise when these dimensions deviate from normal values. Optimally, the dropped fragment count and dropped fragment ratio should be zero. Optimally, origin requests should return only HTTP 200 status codes and there should be no failed requests (HTTP 4XX + 5XX – 412). The data out utilization should preferably not exceed 90 - 95% of the maximum available throughput. The encode detailed view provides the health status for inputs, transcoders, output, and overall health. Optimally, the encoder detailed view should reflect overall healthy status. We love to hear from our customers and better understand your needs! To help serve you better, we are always open to feedback, new ideas, and appreciate any bug reports so that we can continue to provide an amazing service with the latest technologies. To request new features, provide ideas or feedback, please submit to User Voice for Azure Media Services. If you have any specific issues, questions, or find any bugs, please post your question or feedback to our forum.